Orange County Mayor Teresa Jacobs recently provided welcome remarks for the Orlando Youth Empowerment Summit (OYES) at the Beardall Senior Center. This is the fourth year that the City of Orlando has hosted this free, community-focused event which brought together dozens of LGBTQ+ youth, parents, educators, community leaders and local elected officials. The mission of OYES is to empower Central Florida LGBTQ+ youth and community with the resources and education to bring about understanding, acceptance, and inclusion. City of Orlando Mayor Buddy Dyer and District 4 Orlando City Commissioner Patty Sheehan also attended the event which brought together more than 150 youth from across Central Florida. The summit was coordinated by the Orlando Youth Alliance (OYA), a non-profit organization that provides a safe space for gay, lesbian, bisexual, transgendered and questioning (GLBTQ) youth to talk about issues and concerns that are important in their lives, as well as meet other gay youth. OYA is a peer based youth group with members ranging from the ages of 13 to 24. Through the years, OYA has provided support to hundreds of Central Florida youth. The Orlando Youth Alliance has many resources and a growing number of skilled volunteer adult facilitators. These facilitators are community-involved individuals who provide adult supervision during events and youth meetings. The facilitators are available to offer leadership, mentoring and to answer questions or concerns. 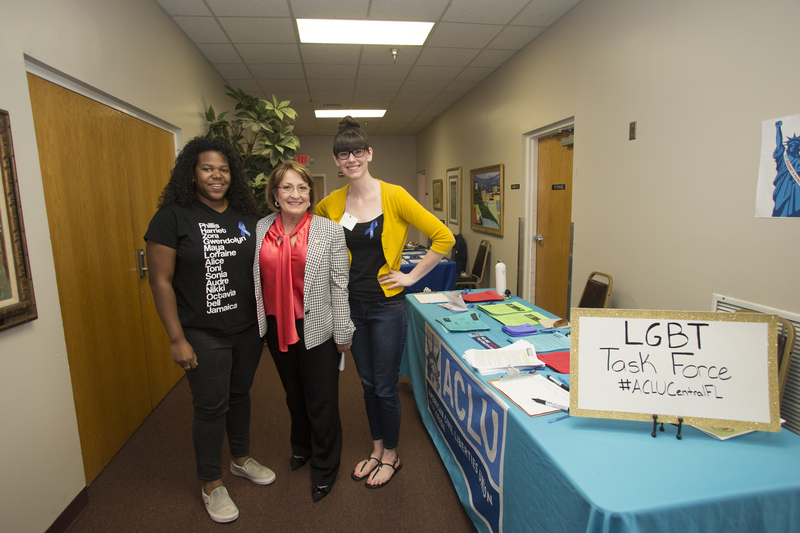 Photo Caption: Orange County Mayor Teresa Jacobs joins LGBT advocates from the American Civil Liberties Union of Central Florida at the Orlando Youth Empowerment Summit.